Jefferson Terrace Salon & Spa is located at 201 Jefferson Street, Jamestown, NY. The building’s second floor is home to Jefferson Terrace Salon and Spa, a stylish, full-service salon. It is as trendy as anything one might find in a major metropolitan area. In January 2008, demolition and renovation work on the upper floor began. Jefferson Terrace Salon & Spa opened for business on November 10, 2008. 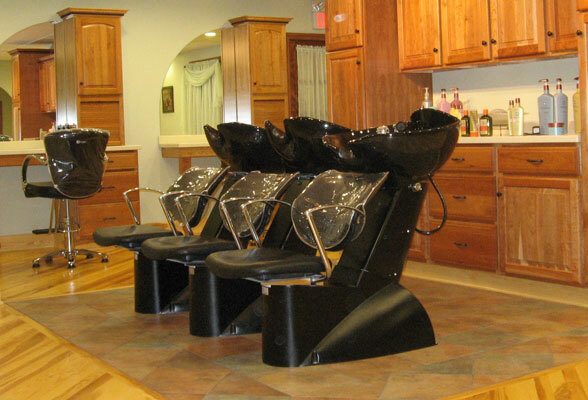 In addition to a full range of hair cut and style services, Jefferson Terrace Salon and Spa features a unique color bar that offers six different color lines. Situated in one corner of the salon’s styling and processing area, the color bar allows customers to see first-hand the color being mixed for their hair and openly discuss various options with their stylist. It also provides a place to provide classes for the stylists. A custom pedicure area, where clients climb onto a small platform featuring lush, pillow-covered benches and soak their feet in custom granite sinks, was constructed in another corner of the salon. Four different pedicures are offered. Across from the pedicure area is a custom-designed massage therapy room where a licensed massage therapist provides five different kinds of massage, and next to the massage therapy room is a room designed specifically for facials. Manicures are offered in an area of the salon near the color bar. We invite you to take a tour of our new business by clicking here, or just stop in and take a look. In spite of all the custom touches and unique services, one of the most defining areas of the salon – a coffee bar and comfortable seating area – is situated near the entrance. Jefferson Terrace Salon & Spa also has a private, 16-space parking lot, for the convenience of the customers. Gift Certificates and Gift Baskets may be purchased in person or by calling (716) 664-7241. We do not accept credit cards. Cash or Check only. For an appointment for any of our services, please call (716) 664-7241.